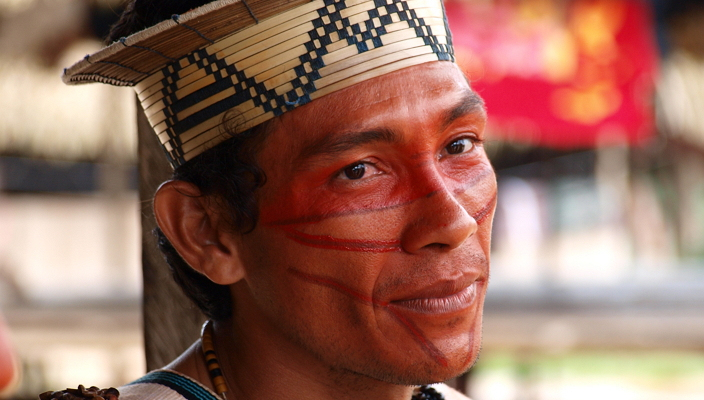 While the world focusses on the World Cup, losing interest in the social unrest in Brazil, another struggle in Brazil’s rain forrest is ongoing: The indigenous people of Ashaninka are peacefully fighting to preserve their habitat. The city of Weimar chose Benki Piyãko out of eleven propositions from all over the world to receive the Human Rights Award 2013. Benki Piyãko, who is leading the people of Ashaninka in the Brazilian state Acre got involved with a peaceful living together of indigenous peoples and non-indigenous neighbors in Brazil. His nomination was suggested by the Society of threatened peoples. Brazil officially recognized the Ashaninka people’s territory in 1980, and self-administration was vested to their community. Consequently following the principles of a peaceful living and coexistence between humans and nature, the Ashaninka pursue their tradition of cultivating the rain forrest in a sustainable way. To pass this critical endeavor on to their descendants, Benki Piyãko founded the education and training centre Yoreke Ãtame („Knowledge of the Primeval Forrest“). The centre teaches indigenous and non-indigenous adolescent people how to live with and within the rain forrest, and brings different ethnic groups together. However, their entirely peaceful way of living and activities brought the Ashaninka around Benki Piyãko a lot of enemies. The wood mafia and drug smugglers assaulted the community several times and threatened to kill Benki Piyãko, if they tried protecting the rain forrest from felling. While industrial as well as the so called green revolution keep progressing and thereby destroying traditional knowledge about nature and farming, people like Benki Piyãko are not only important for the survival of indigenous people, but become crucial to preserve this knowledge.